Pepper is someone I've been hearing about for a few months now, however it wasn't until recently that I decided to give her a proper listen and BOY have I (and you) been missing out. This girl's a vocal powerhouse. While she has yet to release a single, we shouldn't have to wait too much longer. Per Pepper herself via her official Twitter, "First single out soon, album to follow later in the year." In the meantime, Pepper's been releasing a series of acoustic tracks to keep us occupied and impressed, all of which you can hear below, starting with her latest punchy pop masterpiece, "Higher" (BELOW). 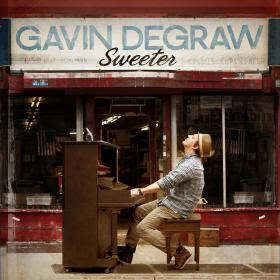 "Sweeter" serves as the title track and second single from American singer/songwriter Gavin DeGraw's fourth studio album. Written and produced by DeGraw and Ryan Tedder, "Sweeter" is a worthy follow up to "Not Over You," which was released all the way back in May of 2011. Why the wait Gavin? "Not Over You" peaked at a reasonably decent #18 on the Billboard Hot 100 chart so you'd think that the label would have been a bit more aggressive with album promo. Starting out with a funky, head-boppin' guitar solo, DeGraw comes in and starts showcasing his skills on the piano. DeGraw really exhibits well-roundedness on this song, coming in strong vocally at the beginning of each verse, and showing restraint towards the end of each line, all the way through dazzling us with his beautiful falsetto. He really sounds his best on those big wailing choruses, mixing the gritty & gruff hard elements of his sound with the soft & delicate falsetto. This is DeGraw really in his funky pop/rock element and I love it.